New Photo Released of Halftime Shows She Has a Healthy Appetite for Her New Home at the Bronx Zoo! Halftime enjoys a fish at the Bronx Zoo. It's been a while since we've updated you on this little pinniped, but we have great news - she has a new home at the Bronx Zoo and her caretakers say that she is doing wonderfully! Halftime made the cross-country trip to New York on March 31, and has been hanging out with other sea lions and getting used to her new digs. This photo, snapped earlier this month, shows a feisty and larger Halftime. "She is fully integrated into our sea lion group on exhibit and is coming along well interacting with the keepers for our training program;" says Josh Charlton, assistant curator, mammalogy, Bronx Zoo. "As you can see from this picture, she is still a champ at eating well! She and the other female year old pup we have in the pool are a riot to watch romp and swim around." If you're in New York, you can now visit Halftime as she makes her public debut at the zoo this week. Read the story below of Halftime's travels along the west coast! Halftime checks out the open space and pool at The Marine Mammal Center in Sausalito, CA. Recently, volunteers from our San Luis Obispo operations rescued a young female California sea lion from a bar in Avila, CA. Nicknamed Halftime (most likely because bar patrons were watching a football game inside at the time) this sea lion was seen on a patio peering through a sliding glass door at the humans inside. Not knowing any better, some bar patrons even tried to give her a drink! Fortunately, a call was placed to the Center and volunteers came out to scoop up the 28 pound sea lion for medical care. On site, they noticed she already had a flipper tag - an ID signifying she had been rescued before. At the hospital in Sausalito, veterinarians learned she had been rescued two other times in Southern California. Barfly Halftime peers through a window at the action inside Mr. Rick's Bar. Halftime was first rescued by the Channel Island Marine & Wildlife Institute in Ventura County on December 22, 2011, and treated and released offshore, in the Channel Islands. Shortly thereafter, Halftime was rescued for a second time, this time by the Santa Barbara Marine Mammal Center in Santa Barbara County, treated for worms, and later released near Santa Cruz Island. Finally, for the third time, on February 4, 2012, Halftime was rescued by The Marine Mammal Center's San Luis Obispo operations. Despite loud music and much human activity, Halftime had boldly made her way onto the patio of a local restaurant (Mr. Rick's, on Front Street), during the halftime broadcast of a football game, in Avila, California. 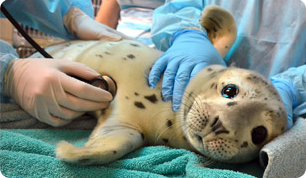 The Marine Mammal Center works everyday to rescue, rehabilitate and release marine mammal patients back into the wild. In fact, last year, 40% of the Center's rehabilitated patients were healthy enough to go back to the ocean! But sometimes, as in the case of little Halftime, life in the wild is not always an option. Unfortunately, Halftime has become too habituated to humans and therefore, would be unable to fend for herself in the wild. She most likely would continue to approach humans, leading to even more troubles for her. For now, Halftime will recuperate at the Center's Sausalito hospital facility. Soon, she will also undergo federally sanctioned "target-training" to get her ready for a successful placement in a safe and healthy facility. Even though it is not the most desired outcome for a wild marine mammal, at least Halftime will be safe and sound, possibly taking on a new role, as an "educational ambassador."